Scene from "The Marge-ian Chronicles," a space-themed episode of "The Simpsons" that aired on March 13, 2016. 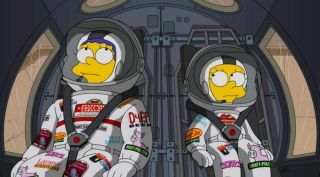 Private Mars colonization has gotten "The Simpsons" treatment. In the venerable show's latest episode — "The Marge-ian Chronicles," which aired Sunday (March 13) on Fox — Lisa applies to become an astronaut with a company called Exploration Inc., which aims to launch colonists toward Mars in 2026. Mars One intends to pay for its ambitious activities primarily by staging a global media event around the entire project, from astronaut selection and training, to liftoff, to the pioneers' time on Mars. Exploration Inc. also relies on corporate sponsorship to pay the bills. There's a lot of other good stuff in "The Marge-ian Chronicles." For example, Homer and Marge aren't happy about Lisa's Mars ambitions, so they ground her. "You are confined to this planet," Marge tells Lisa. "And its moon," Homer adds. Eventually, all of the other Simpsons — Homer, Marge, Bart and baby Maggie — apply to become colonists themselves, in an effort to make Lisa lose interest in the project. This development excites the publicity-hungry Exploration Inc. guys. "A family unit could be perfect for this mission," one of them says. "NASA would never have the guts to shoot a baby into space." There's also a reference to perhaps the best-loved "Simpsons" episode ever — 1994's "Deep-Space Homer," in which "average-naut" Homer launches aboard a space shuttle as part of a NASA plan to get more people excited about space exploration. "Last time, I almost killed everybody," Homer tells the Exploration Inc. guys. Then, one of them asks him what he learned from his previous spaceflight experience. The response is pure Homer: "Lessons, I guess."